Gold stocks have reached a very critical juncture. For all of the stocks that I charted in the prior update (Part III, 7/20/2017) all appear to have performed almost exactly as I described. That's a little scary. But I think it is actually bullish news despite many gold stocks taking a drubbing today. The gold stock weakness today came while gold was $2 higher than last Friday and closed about $0.50 higher, yet the gold stocks did not participate and the vast majority of gold stocks had red closing indicators today. Reviewing the stocks I charted previously: AUY -0.12 (-4.6%), KLDX -0.17 (-5%), NGD -0.03 (-1%), SBGL -0.13 (-2.7%), and HUI index -4.58 (-2.4%). See charts & detailed discussion below. Yamana (AUY) 60 minute chart shows that the price rallied up to $2.64 before turning back to the (red) support line and closed right on the line. If this line is going to behave like support, then the line has been drawn and AUY must not trade below this line and if it does, only very briefly before rallying back above the same (red) line. A hard sell-down, and particularly a close below the (red) line, will be a bad omen -- an early warning that the chart has turned very weak. 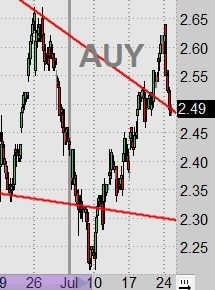 In this event reducing some risk and exposure in AUY may need to be considered. On the other hand, if this (red) line holds as true support, then this may be a good buying opportunity -- still an early warning or alert to be aware of. Kolondex (KLDX) had a very light rally last Friday, but sold down rather hard today, effectively dropping below $3.30 and likely completing the (blue) "c" of "2" that I described previously. 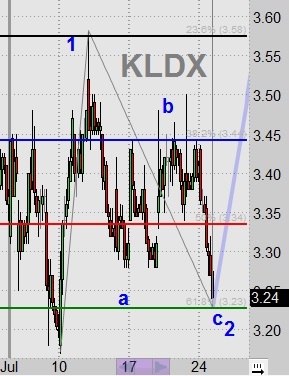 That does not mean KLDX cannot go lower, but it is important to note that the starting point for (blue) "1" was $3.17 and today's low was $3.23, so any trade below $3.17 means the (blue series) Elliott Wave scenario for KLDX is false and will need to be reassessed. The early warning here is only a 6 cent range -- below $3.17 turns this chart bearish. 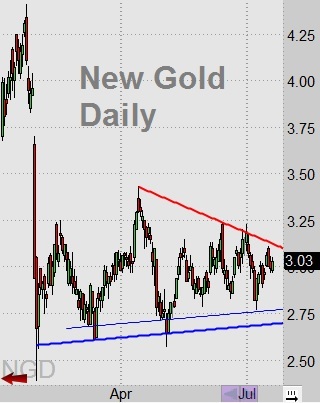 New Gold (NGD) tested the (red) resistance line and quickly backed away from it. Of the 4 stocks being discussed herein, NGD was the least weak, which I interpret with a positive spin that NGD is setting up to re-test and eventually breakout above the (red) line. Of course, being repulsed by the resistance line might also indicate a bearish turn. So monitoring NGD is essential to determine its likely path. At the lower end of the scale there are 2 support lines (see prior NDG daily chart): one at $2.77 and another at $2.70. Should NGD go below these two support lines, then that would be seriously bearish. 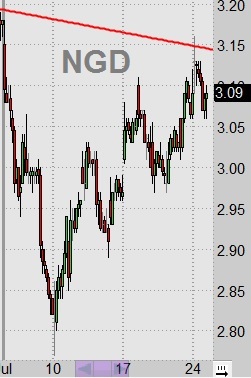 There really are not any "early warning" price levels for NGD at his time -- either it rallies up more than 6 cents as a bullish breakout, or declines more than 39 cents for a bearish break. Or, it just wallows around in between for awhile. 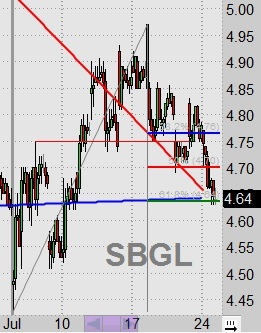 Sibanye (SBGL) came down and retested the (red) support line. But it also tested the lower (blue) support line, and also the 62% retracement. All three of these converged at the same point so it made it a pretty strong target for SBGL to hit. Now SBGL appears to be at an important juncture. A bullish scenario suggests SBGL pulled back as much as necessary before setting up for an imminent strong rally higher. Or, if prices continue to decline then it might re-test the 7/3/2017 low of $4.43. Critical Juncture: These 4 stocks show slightly different chart structures, yet they are all saying very similar tales. If we are going to see higher prices, then a rally in each stock needs to begin immediately Tuesday morning, 7/25/2017. Failing that, then it may portend a bearish omen. Monitor gold & silver overnight. If they are flat to higher then odds are good that gold stocks may show some strength. But if gold & silver are weak overnight, then I would expect gold stocks to continue their bearish weakness. After all, if gold & Silver were slightly higher today and gold stocks could not advance, then a weak gold & silver tomorrow is unlikely to be good for gold stocks.